The diversified agriculture and horticulture programs at Piedmont Technical College continue to garner accolades from across the State. 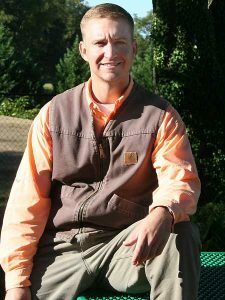 Horticulture program coordinator Aaron Wood recently received the SC FFA Honorary State FFA Degree, the highest honorary degree the FFA association can award. The diversified agriculture and horticulture programs at Piedmont Technical College continue to garner accolades from across the State. At the recent South Carolina Association of Agriculture Educators conference, diversified agriculture instructor Hugh Bland and the ag program were recognized as the Outstanding Adult Ag Ed Program in the Piedmont, Mid State and Lower State regions – three of the four regions of South Carolina. Horticulture program coordinator Aaron Wood was also recognized recently with the SC FFA Honorary State FFA Degree. This degree is the highest honorary degree the FFA association can award and is presented to supporters of the FFA and agricultural education at the state level. To receive the honor, recipients must be nominated by an active chapter. Wood was recognized for his involvement with FFA programs in the area including hosting the State Agronomy contest, hosting the Turf Grass CDE and his work with the South Carolina Commissioner’s School for Agriculture at Clemson University. Wood and Bland continue to work with area FFA programs to recruit students into the diversified agriculture and horticulture programs at Piedmont Tech. “We have worked hard with these chapters, letting them know what great options we have here at Piedmont Tech as a path to higher education or a career,” said Wood. The horticulture technology program at Piedmont Technical College, which falls under the agriculture umbrella, offers a wide range of opportunities – from a one-year certificate to a two-year associate degree. The diversified agriculture program offers a basic certificate and an associate degree, the only degree of its kind in the state. Both programs provide hands-on experience and established transfer agreements with schools such as Clemson and Abraham Baldwin Agriculture College for students who want to pursue a bachelor’s degree after getting real world experience in their field at PTC. For more information on the diversified agriculture or horticulture programs, go to www.ptc.edu/ag.